dynamaxworld.com– the website dedicated to our on-premise digital signage software, POV that has served us faithfully for so many years is undergoing a major redesign. Still work-in-progress, the website is due to go live around the end of July so keep an eye on our LinkedIn page for the exciting announcement. We wanted the new website to reflect our corporate identity as one of the longest established digital signage companies in the industry, our rich history and the dynamic nature of POV, a product that has been developed and refined for the past 10 years. 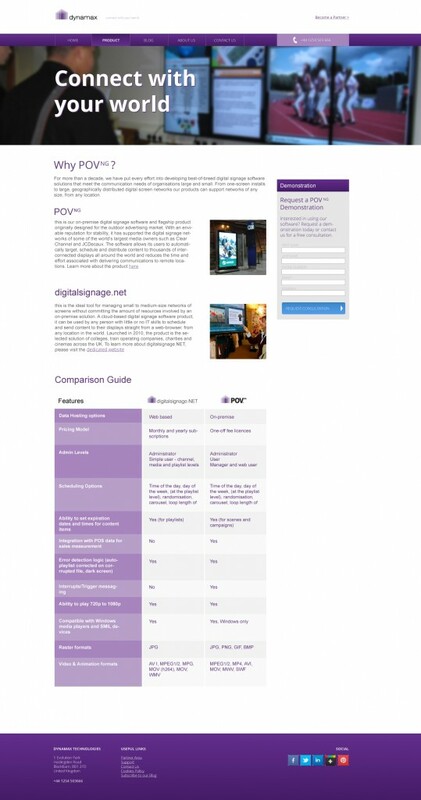 The new Products page will make the connection with digitalsignage.NET, the cloud-based software we’ve invested in heavily during the past three years, and so will the interactive questionnaire from the Home page that will redirect people to the suitable digital signage product for their needs. With updated content, more visuals and improved functionality, the revitalised dynamaxworld.com will reinforce our commitment to the industry and POV and our background as a digital-out-of-home provider. The improved navigation will help visitors find the desired information faster and get in touch with us easier. During the last decade, POV has been the driving force behind some of the world’s most successful digital signage networks, having been used by reputable companies among which the National Exhibition Centre, the latest POV client we were able to feature. To learn more about our digital signage software, please request a free consultation or check out our infographic highlighting the differences between the two products (Cloud-based vs. on-premise digital signage systems). What do you think about our new website? We would love to hear your feedback so please share your opinions below. This entry was posted in Digital Signage, News, Software and tagged digital signage software by Dynamax. Bookmark the permalink.